You know, when the other team tries to hand you a game like that, you really should take it. 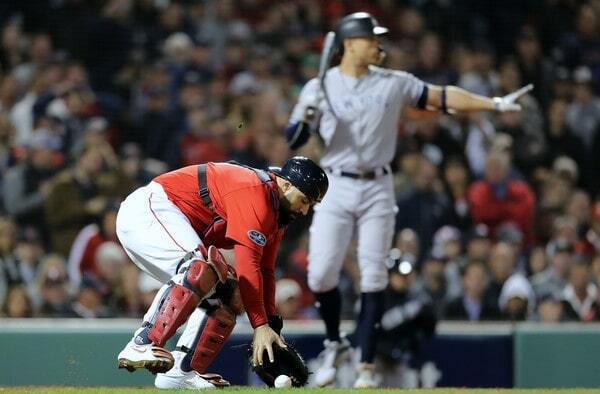 The Yankees had more than enough chances against the soft underbelly of the Red Sox bullpen in Game One of the ALDS on Friday night, but The Big Hit never came. The final score was 5-4. The Yankees have lost Game One of their last four postseason series (2012 ALCS, 2017 ALDS, 2017 ALCS, 2018 ALDS). Good gravy what a disaster start for J.A. Happ. I never really put much stock into the whole “he was great against the Red Sox!” thing — how much more evidence do we need showing player vs. team splits are not predictive? — I thought he should’ve started Game One because he’s been the Yankees’ best pitcher for weeks now. See how easy that is? No need to overthink these things. Start your best available guy in Game One. Credit to Martinez for being such a good hitter and doing damage on that pitch. Setting that up with the four-pitch walk to Pearce was pretty bad. Happ pitched him scared. Pearce hit that grand slam last week and he didn’t see anything close to the strike zone. It was an easy walk. No tough takes. Free baserunners at Fenway and free baserunners in front of Martinez are bad, bad news. Following a 1-2-3 second inning against the bottom of the order, Happ gave up a booming double to Mookie Betts — Betts thought he walked on the previous pitch, which would’ve been preferable to the double — and a bunt single to Benintendi. The bunt was in no man’s land. No one had a play on it. Luke Voit had to field it and neither Happ nor Gleyber Torres were going to beat Benintendi to the bag. And that was it. Happ’s night was over after eleven batters. He allowed five of those eleven to reach base and left behind runners on the corners with no outs. Chad Green allowed both inherited runners to score on a single and two fly balls. Happ’s final line: 2 IP, 4 H, 5 R, 5 ER, 1 BB, 2 K, 1 HR on 44 pitches. Bad. Bad bad bad. The Yankees acquired him for starts like this and he didn’t make it out of the third. Chris Sale’s velocity returned Friday night. Kinda. After averaging 90.2 mph with his fastball in his final regular season start last week, he averaged 94.7 mph on Friday, which good but still a notch below his 96.1 mph pre-shoulder injury average. Also, Sale didn’t hold that velocity. His fastball averaged 91.7 mph in the fifth inning. Clearly, Sale’s still not 100% right. The pitch starts way the hell out there *waves left hand* and winds up all the way over here *waves right hand*. Sale has a great slider. He threw the Yankees a lot of sliders. They had trouble with it. Not really a mystery what happened here, right? Even without his tippy top velocity, Sale was able to be (very) effective because his secondary pitches are so good. It wasn’t until the sixth inning, when he was clearly running out gas, that the Yankees broke through against Sale. Aaron Judge smoked a leadoff single to center and Giancarlo Stanton smoked a one-out single to center. Sale’s pitch count was up over 90 and the Yankees were starting to square him up. Red Sox manager Alex Cora went to his bullpen and that’s where it got dicey. Rather than go to Nathan Eovaldi, who was reportedly available in relief but not used, Cora went to 31-year-old rookie Ryan Brasier, who gave up a hard-hit single to Luke Voit and a run-scoring fielder’s choice to Didi Gregorius. Two runs on the board. Braiser walked Miguel Andujar (not easy to do!) before giving way to Brandon Workman, who walked Gary Sanchez to load the bases with two outs. Gah. To be fair, Workman threw Gleyber five straight fastballs, then broke off a nasty curveball for the swing-and-miss strikeout, but yeah. Torres is a very impressive rookie who’s shown an advanced approach all season. Right there though, he needed to show a little more patience. Workman was very willing to put him on base. Blown Opportunity No. 2 came in the seventh inning. Two singles and a walk loaded the bases with no outs. Workman allowed the singles to Andrew McCutchen and Judge, and Matt Barnes walked Brett Gardner. Bases loaded situations have been the Yankees’ kryptonite this year. I don’t get it. They hit .253/.292/.440 (93 OPS+) with the bases loaded during the regular season. They ranked 20th in AVG, 20th in OBP, 12th in SLG, and 17th in OPS+. Stanton struck out for the first out. 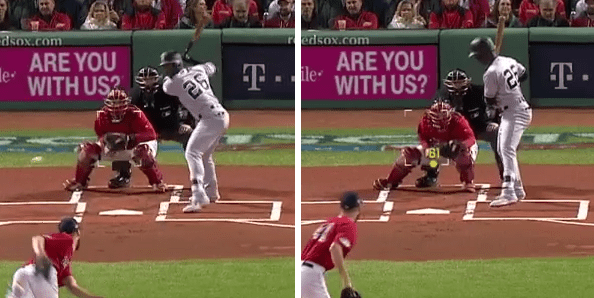 He swung through a high fastball for strike one, fouled away a fastball for strike two, then saw three straight curveballs until finally one was good enough to get a swing-and-miss. Then, with one out, Voit hit a weak tapper to third base that had serious 5-4-3 double play potential. Fortunately Gardner slid in hard (and clean) at second base, forcing a weak throw from Ian Kinsler, allowing Voit to beat it. A run scored. Gregorius followed with a grounder to second to end the inning. So, at one point spanning the sixth and seventh innings, eight of eleven Yankees reached base, and they had four at-bats with the bases loaded. Those at-bats went strikeout, strikeout, grounder, grounder. Not one ball out of the infield. The difference in this game: When the Red Sox had a prime run-scoring opportunity, Martinez hit a three-run homer. When the Yankees had prime run-scoring opportunities, they hit into fielder’s choices. Homers win games, folks. Judge cranked a solo home run against Craig Kimbrel in the ninth — it was one of those homers only Judge can hit, it looked like a jam shot bloop (I thought to myself “get down! get down!”) and it wound up in the bullpen — to get the Yankees to within 5-4, but it wasn’t enough. Kimbrel struck out the next three batters to end the game. The Yankees sent 19 men to the plate against the Red Sox bullpen and eight reached base (.421 OBP). Still not good enough. Don’t get mad at me. No one took a picture of Stanton striking out. Green’s first three batters: 102.4 mph single, 106.5 mph fly ball to the warning track, 101.9 mph fly ball. Yikes. The Red Sox are a great fastball hitting team. Maybe use David Robertson as the mid-inning fireman the rest of the series? The bendy stuff gives the Yankees a better chance at a strikeout. The bullpen was great though. Four relievers (Green, Lance Lynn, Zach Britton, David Robertson) allowed just those two inherited runners in seven innings. Stanton had a base hit that helped start the team’s first rally and he still managed to have a terrible game. He struck out with a runner on first in the first, with a runner on first in the fourth, with the bases loaded in the seventh, and while representing the tying run in the ninth. Kimbrel worked him over in the ninth. Three pitches and Stanton took them all. He jelly-legged the strike three breaking ball. He’ll be on some backpages Saturday. The Yankees had ten hits and five walks. The Red Sox had eight hits and three walks. The problem? The Yankees did not have an extra-base hit until Judge’s ninth inning home run. Singles and walks will only take you so far. The Yankees needed a game-breaking hit and no one provided it. That they managed to score four runs and make the game as close as it was tells you how good the offense is and how crummy the Red Sox bullpen is. Every starter reached base at least once. Judge had three hits and a homer — he is 10-for-23 (.435) with five homers in his last seven postseason games dating back to last year — and Voit had two hard-hit singles. 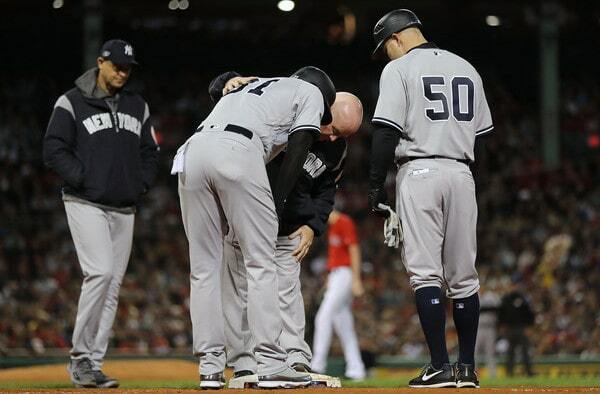 Aaron Hicks had a single and a walk before leaving the game with a tight right hamstring in the fourth inning. He’s going for an MRI in the morning. That could be bad. Game Two. About as much of a must-win as it gets without being a literal must-win. Masahiro Tanaka and David Price are the scheduled starters for Saturday night. That’s an 8:15pm ET start. The AL East race has extended into the postseason. The 162-game regular season wasn’t enough to decide who gets to advance. Tonight, the Yankees and Red Sox open the best-of-five ALDS at Fenway Park. From a fan’s perspective, this will be the best and worst series ever. The highs and lows can be extreme. Three times previously the Yankees and Red Sox have met in the postseason. The Yankees won the 1999 ALCS in five games and the 2003 ALCS in seven games. I reckon we’ll see a certain home run highlight from that series a few times these next few days. The 2004 ALCS was mysteriously canceled after Game Three. Still unexplained. In all seriousness, it’s been a very long time since these clubs met in October. New faces but the same rivalry. Boston won the season series 10-9 with a +14 run differential. Weirdly, there were a lot of blowouts. Seven of those 19 games were decided by at least seven runs. Only four were decided by two or fewer runs. I feel like, right now, the Yankees have their strongest roster of the year. Guys are healthy and some midseason pickups have paid huge dividends. What happened from April through September isn’t all that predictive in a short postseason series when teams match up this evenly. It is a crystal clear night in Boston and chilly. Postseason weather. Tonight’s game will begin at 7:32pm ET and you can watch on TBS and TBS.com. Enjoy the game, folks. Rotation Update: As expected, Luis Severino will start Game Three and CC Sabathia will start Game Four (if necessary), Aaron Boone announced. Severino will be on normal rest in Game Three following his Wild Card Game start. Sabathia is available in relief tonight, probably in an emergency only. Roster Notes: Tyler Wade, Luis Cessa, and Kyle Higashioka were all sent to Tampa to stay sharp in case they have to be added to the roster at some point. Sonny Gray is doing the same but is in New York. I believe Greg Bird and Ronald Torreyes are with the Yankees in Boston. Here’s the ALDS roster. The following is a guest post from Adam Seth Moss, who’s written tons of guest posts over the years. 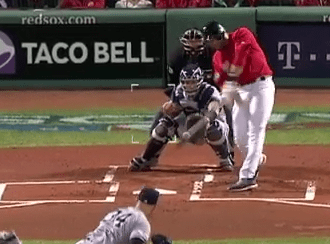 Tonight, the Yankees and Red Sox open the 2018 ALDS, so let’s preview the umpire crew for the best-of-five series. In a bit of a surprise, Cory Blaser is our home plate umpire for the 2018 American League Division Series opener against the Boston Red Sox. Unlike the Wild Card Game, where we had six umpires that were mostly hitters umpires, we have an average umpire by definition. Cory Blaser has a 3.80 ERA in the 2018 season (68th of 89, tied with Nick Mahrley) and a 1.26 WHIP. Batters have an 8.4/hits per 9, 3.0/walks per 9 and an 8.7/strikeouts per 9 record with Blaser behind the plate. Batters also have a .245/.310/.399 batting line. None of these really jump out in any fashion and fall about average or just below it. The native of Denver, Colorado made his MLB debut on April 24, 2010 in a doubleheader at Coors Field between the Colorado Rockies and the Florida Marlins under Joe West’s crew. If it gives you an idea how consistent he is, this is Blaser’s fourth straight postseason assignment, the third straight in the Division Series level. Blaser has 14 career ejections, 12 of which have come in the National League. The two in the AL are of Alex Rios and Gene Glynn, so it can be assumed there is no Yankee experience attached. Only of note was Martin Prado ejected on July 18, 2014 for balls and strikes shortly before he was traded to the Yankees. Get your torches and pitchforks ready. Woooof. We have the first sign of a pitchers umpire in the 2018 American League Division Series. And we mean a pitchers’ umpire. Dan Bellino has a 3.70 ERA (79th of 89), with a 1.14 WHIP (one of the lower ones). Those already are pitchers numbers. Just to rub it completely in: batters have a 7.3/hits per 9 line. 7.3! The walks per 9 are average at 2.9, and the strikeouts are average at 8.4, which given the propensity for the low hit rate and the higher strikeout rate, yikes. To make everything crazier, batters have a .218/.285/.389 batting line with Bellino behind the plate. No one is getting on base, but slugging it out.
? The Chicago, Illinois native made his MLB debut on the 25th of June 2008 at Wrigley Field in an interleague game between the Chicago Cubs and the Baltimore Orioles. Note, Matt Albers started that game for the Orioles. In eleven seasons, Bellino has racked up 37 ejections. Most are for balls and strikes. However, he does have a couple of Yankees on his roster, including CC Sabathia and Joe Girardi on June 7, 2015 for arguing balls and strikes. Bellino got some note from Todd Frazier this year for being ejected by Bellino after complaining mid-inning and reviewing the tape. Be ready for a ginormous headache on Saturday. The crew chief is also the man who was the crew chief for the Mariano Rivera farewell on September 25, 2013 and David Wright’s final game on September 29, 2018. Mike Winters has yet another average strike zone. For years it seemed to lean toward the pitchers, but this year is closer to average. The umpires’ ERA for Winters is 3.87 (tied with Tripp Gibson and punching bag Bill Miller for 61st of 89.) He has a 1.35 WHIP (really high), with an 8.6/H9, 3.5/BB9 (high) and an 8.7/K9 rate. Batters have a .250/.323/.396 batting line. All of these are pretty average, which surprises me.
? This is the 11th Division Series for the native of Carlsbad, California. He made his MLB debut on July 9, 1988 in a game between the Pittsburgh Pirates and the Los Angeles Dodgers at Dodger Stadium, working under the late John McSherry’s crew. That Pirates lineup featured a young Barry Bonds in left field leading off. Winters has 106 ejections over 31 seasons in baseball. He only has one this year, Clint Hurdle all the way back on April 26. He also ejected Joe Maddon twice during the 2017 playoffs. He has only tossed two Yankees in his career: Joe Girardi on May 14, 2011 for balls and strikes and Enrique Wilson on October 6, 2001 over a called third strike. Welp. You knew this was coming. Angel Hernandez has Game 4’s home plate, if necessary. Angel Hernandez is what we call an “umpire known by name,” which usually means you’ve screwed up one too many times in front of a nationally television audience. However, Hernandez has a history of screwing up in many different markets, so he is well known. Aside of Joe West and CB Bucknor, he is likely the third-most known umpire in the majors right now. Hernandez has the first hitters zone of the group, but it’s inconsistent. Pitchers have an ERA of 4.28 with him behind the plate (29th of 89) and a 1.37 WHIP. Batters also have an 8.9/H9, 3.4/BB9 and 8.8/K9 with Hernandez. Those do lean hitters umpire though the strikeout rate is a tad higher than average for a hitters ump. Batters have a .257/.324/.427 batting line, also hitters special just above average. This is the 10th Division Series for Angel Hernandez. The native of Havana, Cuba made his MLB debut on May 23, 1991 at the Astrodome between the Los Angeles Dodgers and the Houston Astros with Mike Winters on Dana DeMuth’s crew. Hernandez has 87 career ejections in the 28 seasons in the majors. Boasting a new number this year (5, over his old 55 – he wore 5 in the National League but got stuck with 55 in the merge), Hernandez has not ejected a Yankee since August 30, 2007, when he tossed Joba Chamberlain for throwing at Kevin Youkilis’ head. Let us keep it clean with him around. The fifth and final home plate umpire we could see in this series belongs to Fieldin Culbreth, and he has another hitters’ zone. He has a guarantee definition of hitters’ zone. It is small. In 26 games this season, Culbreth had a 4.37 ERA (tied for 21st of 89 with 3 others) and a 1.31 WHIP. The batters also have an 8.7/H9, 3.0/BB9 and 8.1/K9. The batters have a .253/.316/.427 batting line. All are just above average and lean toward the hitters. Don’t expect a lot of close calls to go the pitchers’ way. The second umpire with a new number on this crew, DJ Reyburn turned in his long time no. 70 in favour of No. 17, which was worn by John Hirschbeck for so many years. Depending on your preferences, you either do not want or do want Reyburn behind the plate. Reyburn has a 4.47 ERA (16th of 89) and a 1.35 WHIP, which both scream hitters umpire. However, Reyburn’s alternative numbers, 8.8/H9, 3.3/BB9 and 9.0/K9 mean the strike zone is um, a mess. Batters have a .255/.322/.427 batting line with Reyburn behind the plate. So good luck interpreting that into anything besides hitter or average umpire. The native of Grand Rapids, Michigan made his MLB debut at the Oakland-Alameda County Coliseum on June 10, 2008 in a game between the Yankees and the Athletics. 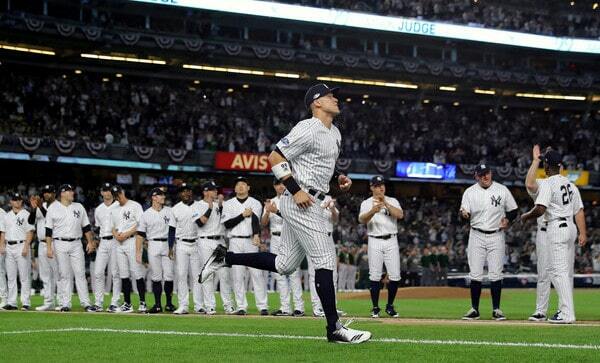 That game was a vintage Chien-Ming Wang start with Jose Veras and Mariano Rivera wrapping up a Yankees win. That day he was part of Jerry Crawford’s crew. Reyburn has 27 ejections in 10 seasons, none of which are of the Yankees. The only notable ex-Yankees on this team are Casey McGehee and Don Mattingly. Otherwise, not much to see here. We have an average to pitchers umpire for the first 4 games really. Bellino is going to make a major headache. Regardless, the four umpires at the bunker in Chelsea are as follows: Marvin Hudson (No. 51), Brian Knight (No. 91), David Rackley (No. 86) and Bill Welke (No. 3). They are making the calls on replay. Hopefully the Yankees can sweep in 3 games and avoid any Angel Hernandez specials, but that Saturday game will be something to see in strike zones of large size. Baseball’s premier rivalry meets again in the postseason, 14 years after a pair of epic Championship Series duels. This time, it will be a five-game set and the Red Sox have home-field advantage thanks to a tremendous regular season. Boston was the only team to best the Yankees in the season series this year, taking 10 of 19 from the Bombers after winning the season finale. The Sox outscored the Yankees, 116-102, and dealt the decisive blow to their division hopes with a four-game sweep at Fenway Park in August. 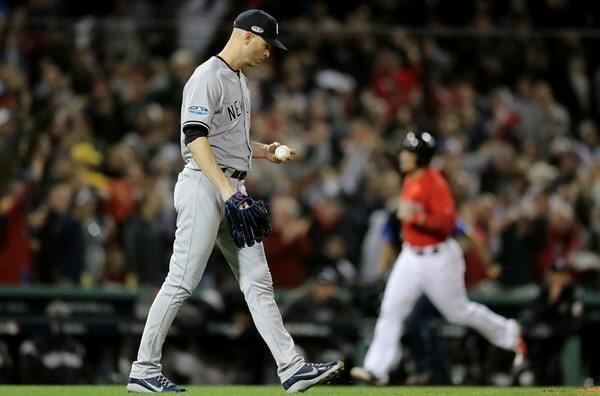 The Yankees took six of nine at Yankee Stadium but mustered just three wins in 10 tries in Boston. Who stood out? 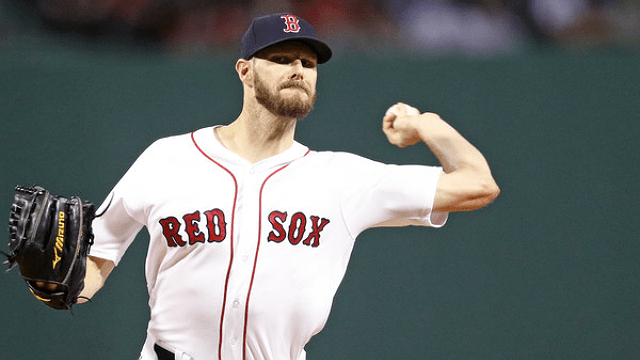 Rick Porcello went 2-0 with a 2.31 ERA over 23 1/3 innings in four starts while Chris Sale allowed just one run over 13 innings across two victories. He held the Yankees to a .118/.220/.250 line. Mookie Betts hit a ridiculous .415/.506/.738 with 14 extra-base hits against the Pinstripers. Meanwhile, Aaron Judge batted .346/.443/.654 with five homers and Giancarlo Stanton hit .371/.423/.700 with five homers and 12 total extra-base hits. Luis Severino guided the Yankees to three wins at the Stadium. Dustin Pedroia, Marco Hernandez, Austin Maddox and Carson Smith are out for the year. 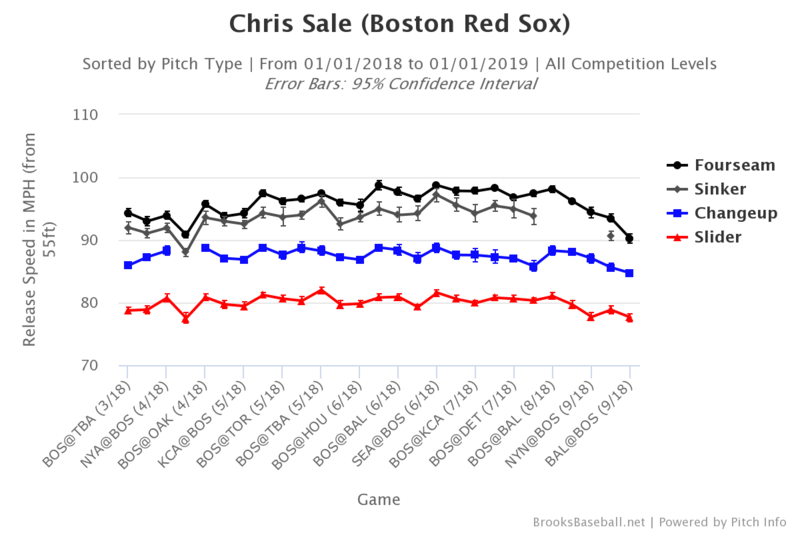 Chris Sale is healthy, but his velocity was significantly down in his last start of the year. Eduardo Nunez has dealt with knee issues for the last few seasons. You know the story. Boston took the league by storm this year, winning a franchise-best 108 wins. They have home-field advantage throughout the playoffs. Their 876 runs led baseball — Yankees were second with 851 — while 647 runs allowed was only bested by the Astros (534), Dodgers (610), Cubs (645) and Rays (646). Betts is the likely AL MVP after leading baseball with a .346 average, putting up a 1.078 OPS and playing a Gold Glove-caliber right field. 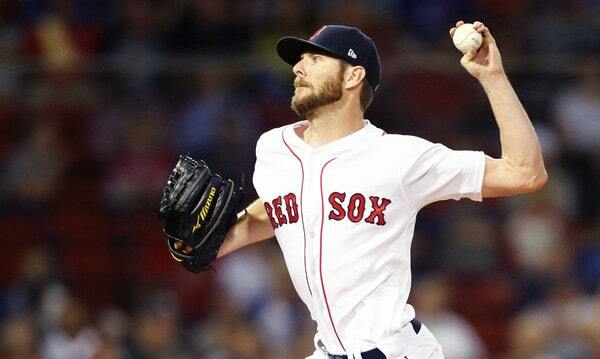 Sale is a Cy Young favorite with a 2.11 ERA over 158 innings while racking up 237 strikeouts. The crazy thing is that J.D. Martinez had a more impressive year in some ways, nearly winning the Triple Crown. The lineup won’t look quite like this in Game 1 with J.A. Happ on the mound for New York. Steve Pearce (140 wRC+, 158 wRC+ vs. LHP) will certainly play first base and Eduardo Nunez (78 wRC+, 71 wRC+ vs. LHP) could take over at third base. Pearce could also start at DH or first vs. righties and force Moreland or Bradley Jr. to the bench. But, hot diggity dog, the top of that lineup is good. You can’t let guys like Bradley Jr. and Leon get on or else Betts, Benintendi and Martinez will make you pay. The stuff: He’s got a 95+ mph fastball, a wipe-out high-80s slider and a low-80s changeup. The guy has some of the best stuff in baseball when he’s on. The questions: Health and ability to go deep in games. Sale pitched just 12 innings over four starts in September. He struck out 18 and allowed just five runs, but he didn’t look quite like himself. Perhaps that was because the games were meaningless. His fastball averaged just 90.2 mph in his final start of the year as his velocity has trickled down his last few starts. Mike broke down Sale’s disappearing velocity earlier today. Performance vs. NYY: Outside of one bad start last September, he’s really had the Yankees’ number since coming to Boston. His seven innings of one-hit, 11-strikeout ball at the Stadium in June was perhaps the best road performance against the Bombers this year. I’ll be brief on the next three starters because Domenic and Mike broke them down over the last few weeks. Here’s Dom’s preview that touched on Price recently. The story with Price is simple: He’s a great pitcher. He’s had a strong second half. But he can’t seem to beat the Yankees’ and their right-handed power, nor has he acquitted himself well in the postseason. Both of those storylines hang over him heading into Game 2. Porcello’s had a fine, average-ish year, as Domenic pointed out last week. Like Price (and Sale), he’s struggled in the postseason historically. However, he’s been able to keep the Yankees off balance and one-hit them at Fenway in August after no-hitting them into the middle innings in April. He was unable to beat them at Yankee Stadium in one try. I can’t put it better than Mike, who broke down Eovaldi’s season and his strong numbers against the Yankees. Check out his piece! If we get this far, I’d bet on Sale starting instead of Price for obvious reasons, though Sale may be needed in relief in Game 4 like last season. On the Yankees’ end, they get to pick between whoever performed better among Tanaka and Happ in the first two games. The Red Sox will have seven relievers for this series, eight if you count Eovaldi in the early part of the series. Craig Kimbrel is the closer, mostly in one-inning stints, though the postseason will likely call for longer outings. Matt Barnes has been his primary setup man both before and since returning from the disabled list. From there, it gets hairy. Recently, Alex Cora has turned to Steven Wright and Ryan Brasier in the middle innings. Wright especially has kept the Yankees off-balance, but the knuckleballer shouldn’t scare the Bombers. Eduardo Rodriguez will act as the long man after missing out on the Game 4 start. Beyond him, the final two spots came down to Brandon Workman, Joe Kelly and Heath Hembree with Hembree missing the cut. Kelly was dreadful down the stretch and Cora will likely loathe utilizing him in a high-leverage spot. Sale’s readiness: He’s barely pitched down the stretch and he’s arguably the most important player in this series. Relying on the bullpen: We know the Yankees can rely on their bullpen, but will they to the extent they need to or will Aaron Boone leave his starters in too long? On the other side, can Alex Cora find a bridge between his rotation and Craig Kimbrel that doesn’t cost his team a game or the series? Left on right: It’s not as simple as the platoon advantages, but the Red Sox are going with two lefties presumably for three of the five starts in this series while the Yankees boast the best collection of right-handed hitting talent in baseball. If Sale and Price can navigate the lineup 2-3 times through with a lead, Boston should take the series. 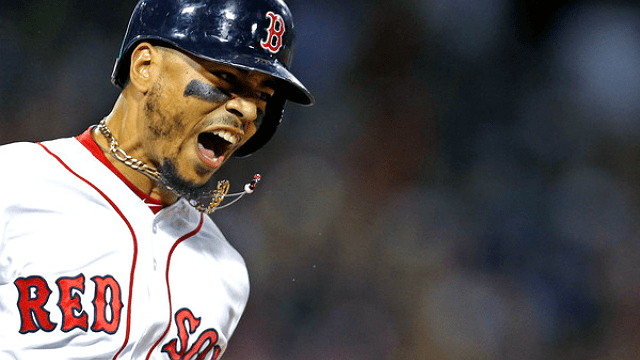 Mookie Betts: He’s so freaking good. Ugh.